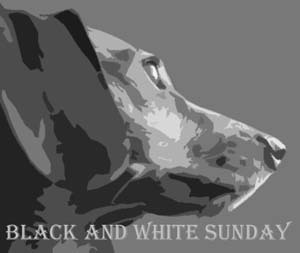 Bringing up Bella: Black & White Sunday - Oh those ears! It's time for the Advent Calendar for Dog Lovers hosted by Kol's Notes, Heart Like a Dog, My Brown Newfies, My GBGV Life & Bringing Up Bella! 24 giveaways in 24 days, plus a grand prize worth more than $500 - who wants to win? Today's giveaway is sponsored by Unbreakoball. You could win durable, practically indestructible dog toys for your dog. Click here to check out the Advent Calendar and enter today's giveaway! Love the ears ... one up ... one down ... and what do you see in the distance, Bella? Hey Bella - looks like some fun in the snow for you today. Love the ears!! Hehe! Great pic!! Those are great ears! Enjoy your walk. I love her ears! What did she hear? Squirrel? Chippy? Cute Bella you better go get it! Bella's rocking the coyote ear! :) Love the photo's composition. Hope your snow doesn't have a layer of ice on top; the punks are not amused. Nice ears! We are ear lovers!